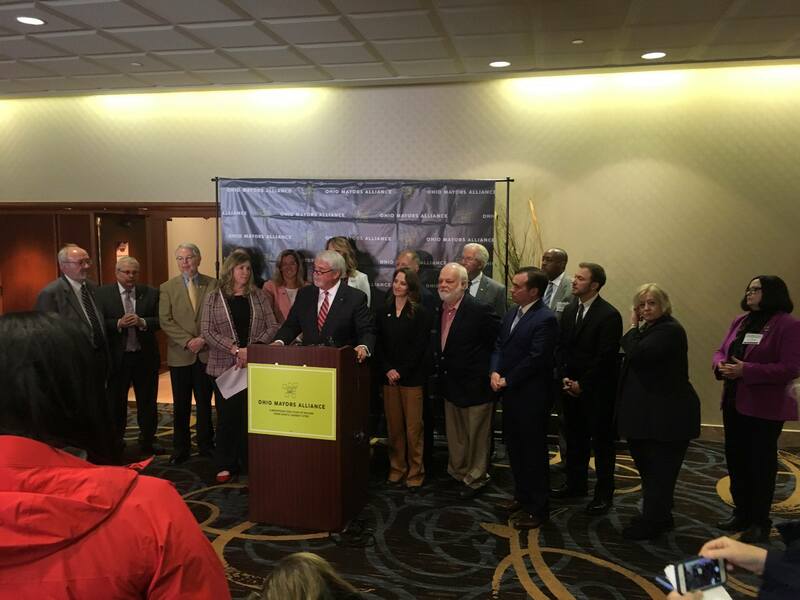 COLUMBUS – The Ohio Mayors Alliance, a bipartisan coalition of mayors in Ohio’s largest cities, convened in Columbus today to push for more state investments into local communities, starting with the approval of Gov. Mike DeWine’s proposed increase in the state motor fuel tax. The group also addressed the urgent need to reform the process for addressing school districts in academic distress. The Ohio Mayors Alliance expressed appreciation for Gov. Mike DeWine’s leadership to responsibly address Ohio’s transportation funding shortfall. They also emphasized the need to reinvest into Ohio’s local communities and urged state lawmakers to do more to support cities through the state operating budget. The mayors also addressed the urgent need of reforming the state’s process for taking over school districts in academic distress. The mayors are concerned about the lack of local input and the prospect of mayoral control following the Academic Distress Commission process. Two Ohio Mayors Alliance cities – Youngstown and Lorain – are currently subject to these state-run commissions, and several others could be next. The Ohio Mayors Alliance also held its first meeting of 2019, where the group recognized House Speaker Larry Householder and House Minority Leader Emilia Sykes for their bipartisan leadership on passing a bill (HB 62) to help address Ohio’s transportation funding shortfall. The group presented both leaders the Ohio Mayors Alliance Commonsense Governing Award. Additionally, the group also appointed Lancaster Mayor David Scheffler to the Ohio Mayors Alliance Board of Directors. Scheffler replaced former Findlay Mayor Lydia Mihalik who was appointed to serve in the DeWine administration as the Ohio Development Services Agency Director. The Ohio Mayors Alliance is a bipartisan coalition of mayors in Ohio’s largest cities. It has been working to strengthen the partnership between state and local leaders since its formation in 2016. For more information on the group’s policy priorities and its members, please visit: www.OhioMayorsAlliance.org.